In his “To ESB or not to ESB” series of post, Ross Mason has identified four common architectures for which Mule is a great fit: ESB, Hub’n’Spoke, API/Service Layer and Grid Processing. In this post we are going to detail an example for the latter architecture. 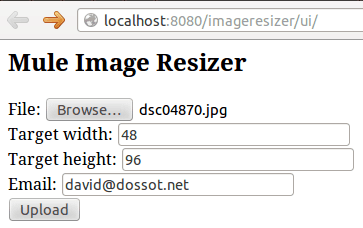 We will use Mule to build a scalable image resizing service. As you can see, we allow end users to upload images to a set of load balanced Mule instances. Behind the scene, we rely on Amazon S3 for storing images waiting to be resized and Amazon SQS as the queuing mechanism for the pending resizing jobs. We integrate with any SMTP server for sending the resized image back to the end user’s email box. As the number of users will grow, we will grow the processing grid simply by adding more and more Mule instances: indeed, each instance is configured exactly the same way so the solution can easily be scaled horizontally. Job Worker – where the image resizing is done and the result emailed back to the user. There is another ancillary flow that kicks in before these two: it’s the flow that takes care of serving the image upload form. Let’s start by looking at it. Mule is capable of service static content over HTTP, using a message processor called the static resource handler. With the above flow, we’re able to serve a basic HTML form that can be used in a browser in order to upload an image and provide information about the desired size and email address for receiving the result. This form submits data to Mule using the multipart/form-data encoding type. Let’s know look at the flow that takes care of receiving these submissions. A simple textual content is assembled and returned to the caller: it will simply be displayed in the browser of the user. When this flow is done, it is up to a worker to pick-up the message from SQS and perform the actual image resizing. And finally the source image is deleted from S3. We record success before deleting the image from S3 because, as far as the end user is concerned, at this point we are done and have successfully performed our task. Note that SQS guarantees that message delivery occurs at least once. This means that it’s possible that a similar job gets delivered more than once. In our particular case, this would mean that we would try to perform the resize several times, potentially not finding the deleted image or, if finding it, sending the resized image several time. This is not tragic so we can live with that but, if that would be a problem, we would simply add an idempotent filter right after the SQS message source, using the unique job ID as the unique message ID in the filter. As detailed by Ross in the aforementioned series of posts, Mule’s reach extends way beyond pure integration. We’ve seen in this post that Mule provides a wide range of primitives that can be used to build processing grids. Have you built such a Mule-powered processing grid? If yes, please share the details in the comment section of this post! I’m curious as to the decision to use Amazon SQS. 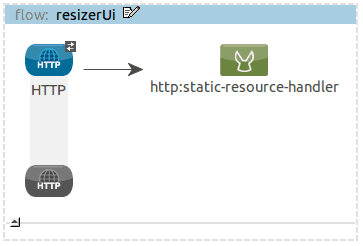 Mule uses hazelcast internally and has the ability to work as a queue. 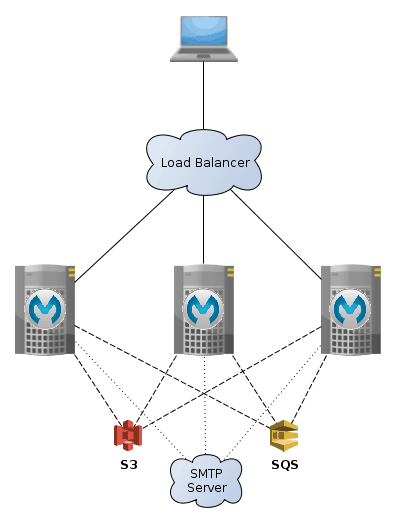 Why chose SQS over hazelcast, or even Mule’s HA clustering using VM queues? One reason is that SQS provides persistent queues. Moveover, the overall solution doesn’t need clustering at all, which can be problematic to scale if you’re processing grid contains hundreds of nodes or if these nodes are disseminated across Amazon regions.